December 14th, 2016 | Categories: Home Staging Tips and Real Estate Trends. 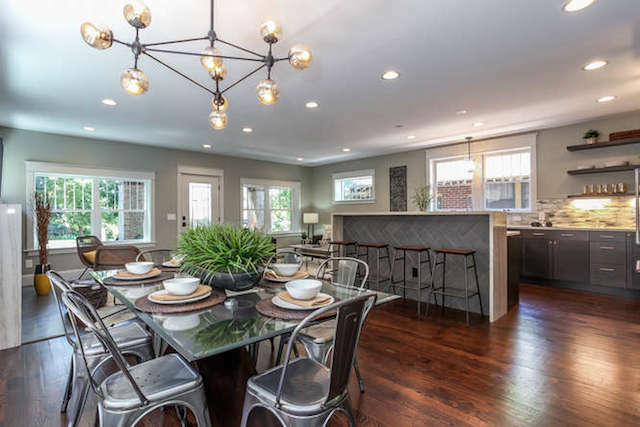 Tags: farmhouse, farmhouse modern, home selling tips, home staging, home staging austin, home staging Colorado, home staging company, home staging hacks, and home staging orange county. Style trends may cycle in and out of fashion, but when you’re selling your home, sometimes capitalizing on the latest home design trends can also mean big bucks. Staging your home with the right design can excite buyers, entice multiple offers, and ultimately drive up your sale price. Farmhouse modern home styling is trending across the country from Los Angeles, to Denver, Austin, and beyond! Learn how to easily style any home with farmhouse modern home staging. There is no bigger trend in home design and home staging right now than Farmhouse style. I love it because it is simple, rustic, and drenched in classic Americana. In fact, the Los Angeles Times recently noted that even homeowners in steadfastly beachy California towns, like Santa Monica, Venice, and Manhattan Beach, have appropriated farmhouse modern style. The trend is so popular that homes here, which were once outfitted in beach-friendly decor, have been staged to look like modern farmhouses by the sea that feature sliding barn doors, shaker cabinetry in the kitchen, and reclaimed woods. The reason for the farmhouse trend could be traced to a number of factors, things like the maker movement, or as the Los Angeles Times suggests, the popularity of HGTV’s Waco, Texas-based, farmhouse style-centric “Fixer-Upper.” Whatever the reason for its resurgence, staging your home in the farmhouse style has proven to be so popular that it actually increases the value of your home. As we talked about here on the White Orchid Interiors blog before, design features like farmhouse sinks, shaker cabinets, and barn doors increase your expected sale value between 7.9%-14% and help you sell your home faster! To check out which of these farmhouse features adds the most value to your home, click here. Because farmhouse home staging has proven to be incredibly successful, you’ll likely want to take advantage of the trend in order to sell your home for more money – and fast. From Texas, to California, Colorado, and beyond, a number of homebuyers are seeking farmhouse style home staging. So whether you plan on hiring the best professional home staging company, or doing DIY home staging, I’ve got a few tips and decor picks so you can easily achieve farmhouse modern home staging style, regardless of your home’s architectural style, or its location. Sliding barn doors are the top farmhouse home staging feature that will sell your home for more! In fact, homes with this farmhouse feature sell for 13.4% over their expected value, according to Zillow. Check out this barn door how-to from DIY Network here. Wildlife art can help you achieve a lot of farmhouse style bang for your buck when staging your home. Utilizing art that depicts wildlife, such as buffalo or horses, is a home staging choice that fits well for homes in Denver. But even you’re not selling in Colorado, staging your home with wildlife art will have your home evoking a sense of Americana in no time. Farmhouse colors are a soft palette. Think pastels and vintage-inspired colors. Colors that are ideal for farmhouse home staging will also typically feature a dose of gray. 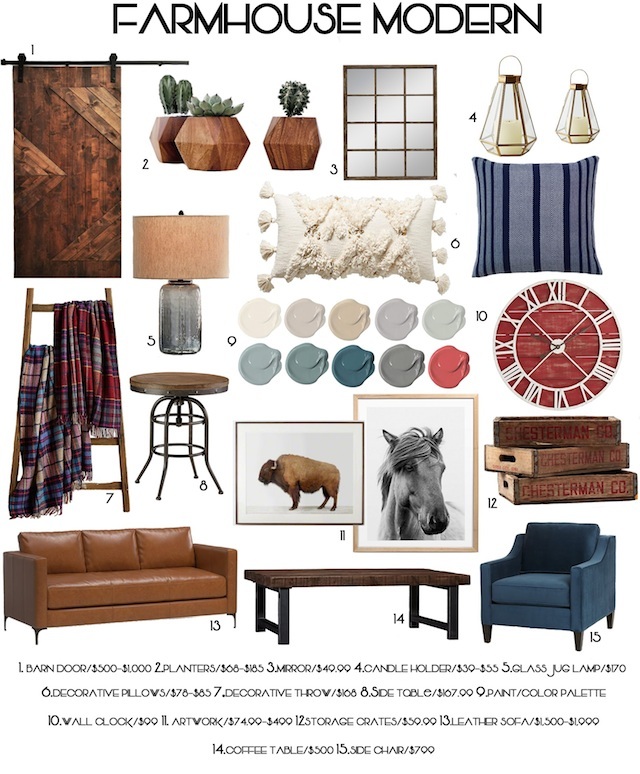 Take a look at the color palette on our mood board for some farmhouse home staging inspiration. For more tips on which hues are for you, check out Benjamin Moore’s helpful blog on rustic paint colors here. Looking For The Best Farmhouse Home Staging? Ready to stage your home? You can click here to find the top home stager in your area and get a free instant quote with White Orchid Interiors. When it comes time to interview your prospective home stager make sure you’re prepped by knowing the answers to these ten key home staging questions that every home-seller should know.